The peace treaty between Israel and Egypt brokered by the United States in the late 1970s provided a bedrock for Middle East stability that has lasted for 40 years. For four decades, every American administration maintained that peace by supporting both Egypt and Israel. However, the current U.S. government has neglected, scorned and sidelined both nations. Washington’s debasement of Israel is well documented, but its treatment of Egypt under the leadership of Abdel Fattah al-Sisi has been similar: shameful neglect of a longtime ally. This rough treatment is astounding considering the fact that not since Egyptian President Anwar Sadat’s assassination in 1981 has there been a closer alignment between Egypt’s interests and the traditional interests of the U.S. But that’s the point: This American administration is anything but traditional. Here is a look at a few of Sisi’s exploits that would have made any previous American administration eager to work with him. He understands Israel’s security concerns. In a number of recent interviews, Sisi has revealed his support for Israel’s fight, not just against Hamas, but also against a nuclear Iran. “We have to understand the Israeli concern,” Sisi told the Washington Post (March 12). He revealed he talked to Israeli Prime Minister Benjamin Netanyahu “a lot.” Egyptian Maj. Gen. Sameh Seif Elyazal (Ret.) has explained, “We have a mutual understanding between Egypt and Saudi Arabia, and, it is not a secret to tell you, with Israel as well!” (Wall Street Journal, March 18). Current trends led Jerusalem Post deputy managing editor Caroline Glick to proclaim, “Today Israel’s closest ally is Egypt. Under Obama, the U.S. is a force to be worked around, not worked with” (February 5). He defends freedom of maritime trade through the Red Sea. Earlier this year, Iran used its Houthi proxies to dismantle the government of Yemen in order to control trade through the Bab el-Mandeb Strait at the southern tip of the Red Sea. Egypt, the gatekeeper of the Suez Canal at the northern reach of the Red Sea, reacted strongly, warning that it would defend freedom of traffic through the Bab el-Mandeb Strait. Egypt’s Suez Canal Authority chief, Mohab Mamish, said Egypt “will not accept” the closure of the waterway. Sisi also invited ousted Yemeni President Abed Rabbo Mansour Hadi (historically a U.S. ally) to the Arab summit in mid-March, showing that he rejected the legitimacy of Iran’s takeover of Yemen. He promotes religious freedom within Egypt. 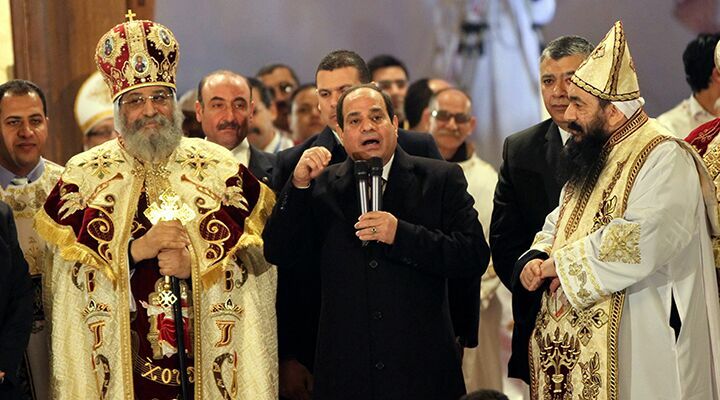 While much of the Middle East suffers from religious helotism, Sisi actively promotes the equal rights of all religions. He visited a Coptic church on Christmas, the first Egyptian president ever to do so. He “has positioned himself as a defender of the country’s Christians,” reported the Wall Street Journal (February 16).